White Lion Organic Classic English Loose Tea 4oz Glass Jar, White Lion Cranberry Hibiscus Loose Tea 4oz Glass Jar, Stainless Steel Tea Infuser, India Tree Unrefined Brown Sugar Cubes 12oz bag, Carolina Girl Cooks Orange Cardamom Tea Cookies 5oz, Geddes Farms Orange Blossom Honey 16 oz, Wooden Honey Dipper Stick, ArtfulTea Variety Pack of Exquisite Organic Teas: Apricot Brandy Black Tea, Moroccan Mint Green Tea, Sunrise Melody Green Tea, Rose White Tea, Egyptian Chamomile, and Earl Grey Rooibos Herbal Tea. 1 Individual Bag per Flavor. 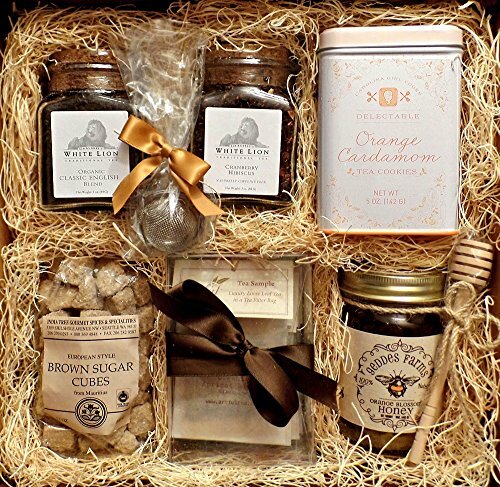 Tea gourmet gift box, a great variety gift basket option. If you have any questions about this product by Taylored Gourmet, contact us by completing and submitting the form below. If you are looking for a specif part number, please include it with your message.